The most celebrated of the Dutch landscape painters, Ruisdael also painted a number of impressive seascapes, all of which appear to date after 1656, when he had left his hometown of Haarlem and settled in Amsterdam, Holland's largest city. In this example he focused on the IJ, the arm of the Zuider Zee that forms the harbor of Amsterdam, just barely visible on the horizon at the left. 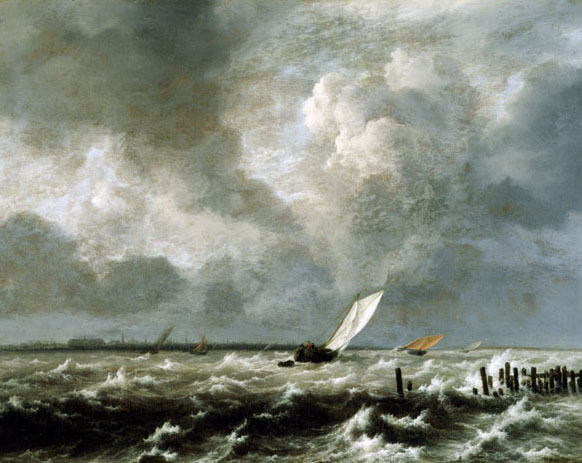 Ruisdael's main interest was the force of nature indicated by the agitated water and ominous sky. In the movement of the clouds overhead, we can almost feel the wind blowing across the sea or anticipate a sudden shift in the pattern of light and shadow on the water. Like so many of his contemporaries, Ruisdael used his art to comment on nature's transitoriness, and in this case, the carefully placed sailing vessels, dwarfed against the vast sky, suggest man's subservience to the atmospheric elements.